Likes: Cover stock on the PLATNIUM was aggressive enough to allow the ball to turn the corner off the back of the pattern with no problem. The ball responded aggressively at the break point and will fit well between my Seismic Venator and Euphoria. The PLATNIUM was several boards stronger off the break point then my Euphoria and cleaner thru the heads than my Venator with a similar strong ball movement off the break point. Sabre Lanes THS: Older well kept wood surface, 43 foot. Keeping my hand back I can play straighter lines 12 out to 8 or so movement starts about 45 feet very nice motion off the spot. Adding Hand to the shot I am allowed to play far deeper, 15-17 at the arrows going out to 8 Platinum shows a great ability to recover even from shots missed right of target. As the lanes transition either release will still allow me to get to the pocket as I move deeper the ability to recover from deeper lines or misses right. SHORE VIEW LANES THS: this shot on Ebonite Synthetics is kinda funny this season not much volume in the mid lane thus we start with a fair amount of hook but as the oil we end with a very quite backend. Playing the Platinum straight early in the night I can play to the right of most other power guys and delay transition for a few extra frames. Going 11-12 to ten or so at 46 to 47 feet at the break point. This house is known for pins flying up in the air, Platinum keeps them down on the deck while still having messengers coming when they are needed. HIT/CARRY: As stated above this ball ball is great for keeping pins low on the deck. Messengers come into play when they are needed. COMPARE: To the BlackOut same Layout, Platinum is longer and more angular a touch harder hitting about 2 boards stronger overall. When Compared to the Original Solaris Pearl the Platinum has the same shape just less overall hook hit and carry are identical. 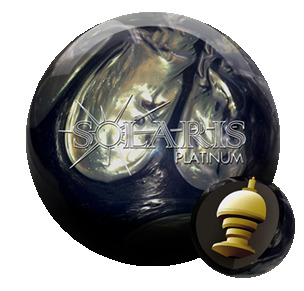 Overall it is a great Blend of the BlackOut and Solaris Pearl taking the best from both balls and almost combining them into one ball. Overall: Great Ball it quickly replaced my BlackOut in the bag, for me the Platinum is better overall, where the BlackOut was more pure control. Platinum allows me to play striaghter than most earlier in blocks and as the lanes go I find myself not making big jumps left which is great for a lot of the drier THS patterns people talk about these days. While still allowing me to move in and wheel the ball from the deep when the pattern and lane surface allows. Type (THS, Sport Pattern etc): House pattern on worn Brunswick Anvilane. Kegel Fire conditioner (burns up on the blend really fast.) So a little trickier and softer backends than a lot of houses. Likes: Good looking ball - will sell if displayed! Clean front end, controlled backend, still covers as much lane as you want. REALLY adaptable with release changes. Dislikes: Can pick pick up the midlane suddenly. Keep an eye on your moves and know your house. Likes:Love the colors and how great the ball rolls. Clean through the fronts, nice mid lane read, with a strong almost flip at the break. Dislikes:None except I didn't drill one sooner! Coaches aren't born, they are made! Changing bowling, one bowler at a time! Page created in 0.662 seconds with 22 queries.